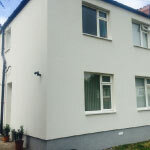 Preparation For External Rendering Glasgow – Unless the wall has been recently built, ATC will need to remove any debris or loose dirt – remove any plants growing up it, scrub off any mould with a bleach solution, and hose down the wall to remove any dust and dirt that could stop the render from adhering. 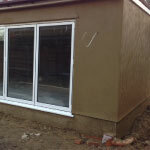 Applying The First Coat Of External Rendering Glasgow – If there is a wide wall to render, setting up screed battens would be recommended – these can be 10mm thick wooden battens, which fix to the wall. We would place them about 900mm apart, and make sure the screws are flush with the face of the timber because we will be using these battens to help you level the render. These battens serve to divide the wall up into more manageable portions, and also gives a starting point to gauge how thickly to apply the render. Scratching the surface of the first coat enables the second coat to bond – plasterers will use an over-sized comb type tool for this. The second coat can be applied after a few hours of the first. Applying The Second Coat Of External Rendering Glasgow – Applying the top coat of render in the same way as the first one, but not as thickly – it should be about 6mm thick. We would either set up battens again or do this free-hand depending on the specifications of the job. 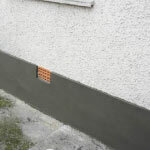 Using a straight-edge to level the render again, filling in any gaps, and then finish it with a wooden or plastic float.